Ever since Pokémon GO launched, we've loved hearing stories of Trainers venturing abroad and playing together with new friends from different countries. That's what inspired us to create Pokémon GO Travel, a new video series to see the world through the eyes of a Pokémon Trainer. 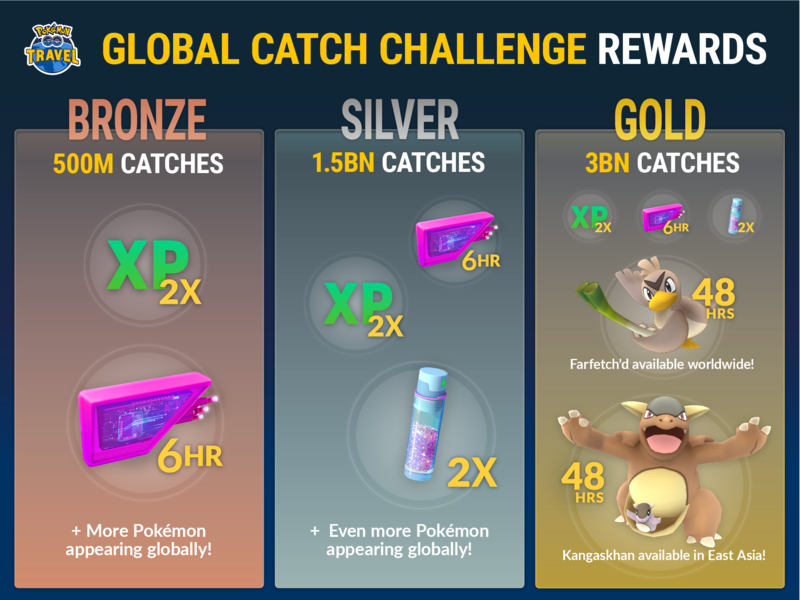 To kick things off, Pokémon GO Travel is taking a diverse group of Trainers from around the world to Japan to host our first-ever Global Catch Challenge. Join us as we discover new places, meet new people, and work together in an attempt to catch 3 billion Pokémon in just 7 days. Play along with IHasCupquake, Coisa de Nerd, and Rachel Quirico as they learn more about Japanese culture, inspire the world to play together, and update you on the amazing rewards the community unlocks along the way. We can’t wait to take you along on this amazing adventure and hear what you think about the Pokémon GO Travel tour. We’ll be posting daily updates on Rachel, Tiffany, Gabi, and Leon’s adventures and are curious to see your updates, too! On a trip? Venturing to a new part of town? Share your #PokemonGOtravel story with us this week on your favorite social media channels. Com 500 milhões, será liberado o XP em dobro e lure de 6 Horas. 1,5 Bilhões, XP dobro, Lure de 6 Horas e Stardust em dobro. E com 3 Bilhões, teremos 48 Horas para capturar o Farfetch,d .